Stem cell therapies for heart disease have failed so far, much to the high expectations of scientists, patients and society to get objective clinical proof for heart repair, despite abundant research proof in animal studies. The Rostock University cardiac surgeon, Prof. Gustav Steinhoff, and his research team, have now unraveled the cause of failure in bone marrow stem cell response and published their results in EBioMedicine. In the randomized double-blinded placebo-controlled phase 3 PERFECT-trial studying stem cell therapy in bypass patients, forty percent of all patients were identified as having a suppressed bone marrow response for repair related to the regulatory gene SH2B3. This results in a deficit of circulating stem cells and prevents new blood vessel growth in the heart muscle, required to avoid progressive heart failure. This pilot trial was financed by the Ministry of Research and Education in Germany and the EU for the development of highly standardized stem cell therapies, and was performed between 2009 through March 2016 to assess clinical safety and efficacy of intramyocardial CD133+ bone marrow derived cell application and coronary bypass surgery. 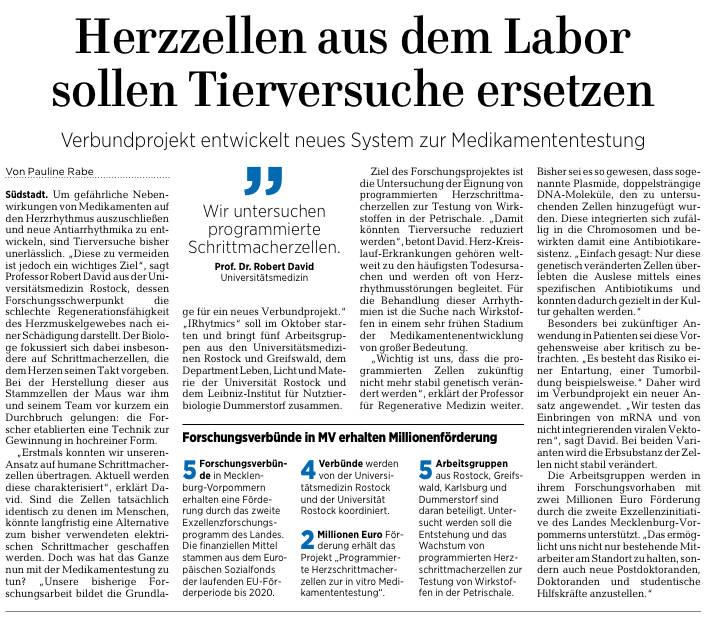 The multicentre trial included the six main German university heart centers Bad Oeynhausen, Berlin, Hamburg, Hannover, Leipzig, Rostock, the German stem cell isolation product specialist Miltenyi-Biotech GmbH, Bergisch-Gladbach, and scientists in Freiburg, Munich and Göttingen. Professor Gustav Steinhoff is the principal investigator of the publication and has spent one year analyzing the data with a specialist team of university and biotech company researchers. "It was an enormous puzzle. After unblinding, the clinical results of the study did not at all reveal the expected results of the stem cell therapy. But there was a surprising overall improvement in all treated patients irrespective of stem cell therapy, leading to a 10% gain of heart pump function." said Gustav Steinhoff, who pioneered cardiac stem cell therapy with the first intramyocardial treatment in 2001, initiating the first Phase I trial in the field. "And then we discovered that 40% of the patients did not show improved heart function at all, whereas the 60% of reactive patients had a mean increase of 17% pump function and better long-term survival." The researchers succeeded in finding a diagnostic biomarker signature in the peripheral blood of patients by using an artificial intelligence machine learning computer analysis system, allowing pretreatment identification of patient responders for improved heart function. Using this new computer-aided diagnostic technology, responsive patients can be accurately identified prior to treatment with bypass surgery and stem cells. 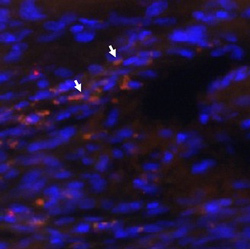 Heart function improvement is dependent on circulating endothelial progenitor cells. 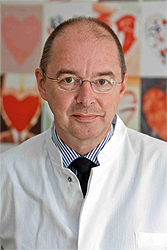 The Reference and Translation Center for Cardiac Stem Cell Therapy (RTC) was founded in 2008 on the initiative of Prof. Dr. Gustav Steinhoff, heart surgeon and scientist at the University Medical Center Rostock, as one of the five translation centers for regenerative medicine in Germany which are funded by both by the federal and the state government. The RTC is hosted by the Biomedical Research Center (BMFZ) Rostock. At the RTC high-performance medicine is being conducted. With focus on cardiovascular diseases innovative approaches for stem cell therapies are being developed in labs applying most modern molecular- and cell biological investigation methods and evaluating them in animal models - frequently in cooperation with industry partners. Following the demonstration of safety and efficacy in the clinical study center of the RTC the new therapies are being integrated into the patient care activities of the Clinic for Heart Surgery. The concept of the RTC includes all translation steps in the scope of both development and manufacturing of stem cell products as well as treatment of patients in a standardized and quality-assured manner according to the legal requirements of “Advanced Therapy Medicinal Products”. Accordingly, the RTC takes the position as a reference centre. The SFB application "Mechanistic approaches towards cardiac regeneration" was honored with the prize for collaborative research at the 4th "Forschungsworkshop" of the University Medicine Rostock. RTC Rostock is today receiving the first ELYRA PS.1 series microscope from Carl Zeiss in entire Europe. Rostock. Scientists at the Reference- and Translation Center for Cardiac Stem Cell Therapy at the University of Rostock (RTC) are now able to visualize molecules with a microscope system with a localization accuracy of up to 10 nm. This is achieved with a new product from Carl Zeiss MicroImaging GmbH, the microscope ELYRA PS.1. Besides Osaka the RTC Rostock is going to be the first user worldwide of a series system based on this technology. The project is funded by the Federal Ministry of Education and Research (BMBF). „Our research deals with the efficacy, safety, and the further development of stem cell therapies against heart diseases. 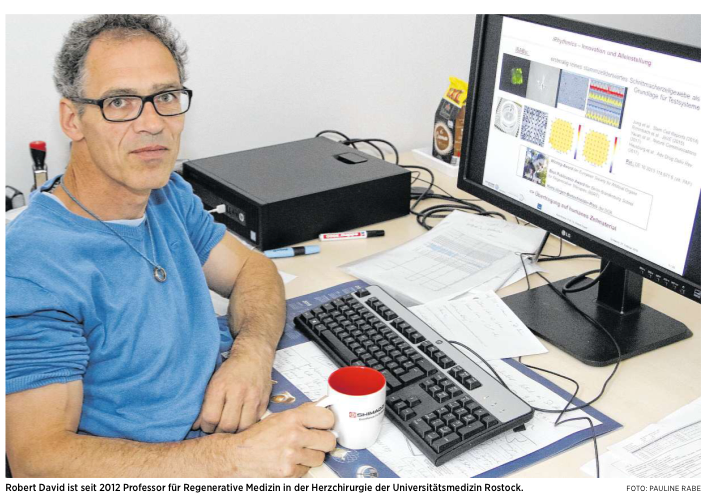 ELYRA will support our research “ Prof. Gustav Steinhoff, head of the RTC Rostock, explains. This microscope offers new interesting possibilities, especially for gene-technical and nano-technological approaches with stem cells. To improve the therapeutical efficacy or the survivability after transplantation the cells are genetically modified by using gene transfer systems. The gene transfer is currently conducted with a novel method whose mechanism has not been fully understood yet. Neither, it is known whether the modified cells are exposed to unexpected side effects. 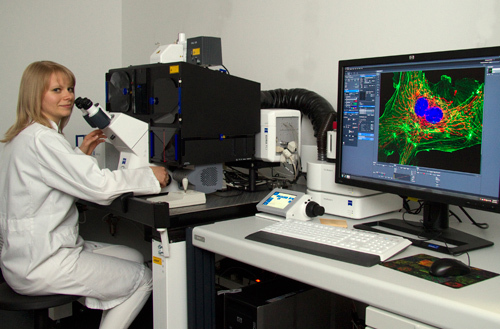 Evgenya Delyagina, researcher at the RTC Rostock, will examine genetically modified stem cells with the help of the new microscope ELYRA PS.1. With ELYRA PS.1, cell processes in live cells can now be observed and documented on a molecular level for the first time. Before that, it had been possible to image cellular structures with electron microscopy with a spatial resolution of up to 10 nanometers; however, living cells were destroyed in the course of the imaging procedure. Combining two innovative technologies, SR-SIM und PALM, the ELYRA PS.1 is able to provide super-resolution which has not been available in the fluorescence microscopy technology until today. A doubling of the resolution of a conventional fluorescence microscopy has been achieved with the SR-SIM (Super-resolution Structured Illumination Microscopy) technology. The necessary labeling can be performed with all common fluorescent dyes. The PALM (Photoactivated Localization Microscopy) technology offers a localization accuracy of up to 10 nm using e.g. shiftable fluorescent proteins. The ELYRA PS.1 at the RTC Rostock combines the super-resolution technology with the LSM 780, which is the latest and most effective confocal Laser Scanning Microscope from Carl Zeiss. Although stem cells from different sources show identical phenotypical features their therapeutic potential differs clearly from each other. Scientists from the University of Rostock were able to demonstrate for the first time that bone marrow-derived stem cells are most efficient for a stem cell therapy after myocardial infarction. In comparison, stem cells from umbilical cord blood are less conducive to the healing process. This study has recently been published in „PLoS one“ on 11st February. The working group of the Reference- and Translation Center for Cardiac Stem Cell Therapy at the University of Rostock (RTC) investigated mesenchymal stem cells (MSC). „This subset of adult stem cells can be found in human bone marrow, adipose tissue as well as in umbilical cord blood“ explains Ralf Gäbel, who is a Ph.D student and the first author of the published article in PloS one. „MSC are very interesting for autologous therapies, which means that a patient can be treated with his or her own stem cells“. Until now, MSC which have differentiated in a culture dish have not yet been tested in humans to treat heart diseases but only in mice. For the current clinical studies hematopoietic bone marrow-derived stem cells are being used. On the one hand, the different regeneration ability of the MSC from different tissues was investigated. On the other hand, the researchers were looking for features permitting to distinguish the MSC from the three different sources. Finally, their impact on the regeneration efficiency was tested. „Researchers from Mannheim already showed 2006 that umbilical cord blood-derived MSC produce less endoglin (CD105) compared to bone marrow- and adipose tissue-derived MSC“, Ralf Gäbel said. „Endoglin is a key enzyme in biochemical signal pathways which induces angiogenesis and has an anti-apoptotic effect in diseased tissues“. In fact, the results of the comparative analysis in animals prove that umbilical cord blood-derived MSC are less therapeutically efficient compared to thoses from the two other sources. However, umbilical cord blood-derived MSC with high endoplin-expression show similar regeneration potential as bone marrow-derived MSC. The cell biologists from Rostock concluded that further in-depth studies are needed before stem cell therapies (and especially those involving umbilical cord blood-derived MSC) can be applied in humans. At the Reference- and Translation Center for Cardiac Stem Cell Therapy (RTC) at Rostock University novel treatment methods with stem cells for heart diseases are being investigated and applied. The overarching goal of these activities is to enable the long-term healing of the damaged heart on the basis of regenerative medicine. Currently, clinical stem cell studies are performed with hematopoietic stem cells at the University of Rostock. However, basic research conducted within the RTC also includes the further development of therapy possibilities, as well as the investigation of MSC. The RTC Rostock was established in 2008 by the initiative of Professor Dr. Gustav Steinhoff, director of the Clinic and Policlinic for Cardiac Surgery of Rostock and the Research Laboratories of Cardiac Tissue and Organ Regeneration at Rostock University. It receives funding fom the German Ministry for Education and Research (BMBF), the Ministry for Economics of the federal state of Mecklenburg-East Pommerania, as well as in the frame of industry cooperations. 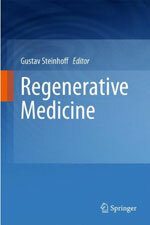 “Regenerative Medicine – from protocol to patient” has been released by Springer in February 2011. This new textbook is edited by Gustav Steinhoff, professor of Cardiac Surgery at Rostock University. It provides an overview of the scientific knowledge and emerging technology on the field of regenerative medicine as well as the clinical application in different organ systems and diseases. International leading experts describe the latest scientific and clinical knowledge of the field of regenerative medicine. Additionally, the process of translating science “from bench to bedside” is explained in sections on basic science, clinical translation, regulatory, ethical and industrial issues. The textbook addresses to students, researchers, health care professionals, physicians, and patients, who are interested in an interdisciplinary survey of this promising field of science and medicine. The Regenerative Medicine is a fast emerging field of research and clinical therapies on the repair, replacement or regeneration of cells, tissues or organs in congenital or acquired disease – and just starting to be the most fascinating and controversial medical development at the dawn of the 21st century. The editor, Prof. Steinhoff, is the head of the Reference and Translation Center for Cardiac Stem Cell Therapies at Rostock University and an internationally known pioneer of autologous stem cell therapies related to cardiac surgery. Researchers at RTC have recently identified a new immune cell. The new immune cell, named CD8+AT2R+ T cell, mediates protective actions against inflammatory heart damage. The research, led by Dr. Jun Li, a group leader at RTC was published in The Journal of Immunology in the November 15th issue. The discovery of new T cell allows the researchers at RTC to further dissect the orchestration of neurohormone and immune cell and to open completely new avenues for future cell therapy in treating patients with inflammatory organ damage such as acute heart attack. The neurohormone angiotensin II induces vasoconstriction and increased blood salt levels mainly via AT1 receptor (R); thus AT1R blockers are used clinically to treat high blood pressure and cardiac failure. Less is known about the functions of AT2R. In recent years, however, there has been growing evidence that increased levels of AT2R in the heart correlate with cardioprotection following acute myocardial infarction (MI). To better understand the role of AT2R, Dr. Jun Li and his colleagues discovered the CD8+AT2R+ T cells and studied their functional role following acute MI. Seven days after MI, the numbers of CD8+AT2R+ T cells were increased significantly in the hearts and spleens of MI rats, compared with sham-operated rats. Unlike CD8+AT2R- T cells, postinfarct CD8+AT2R+ T cells did not exhibit cytotoxicity toward cardiomyocytes in coculture and were instead found to secrete cardioprotective IL-10 in response to AT2R-mediated stimulation. In vivo treatment of rats with an AT2R agonist, compound 21, was found to increase the numbers of IL-10–expressing CD8+AT2R+ T cells in the infarcted myocardium relative to untreated rats. Furthermore, the transplantation of postinfarct splenic CD8+AT2R+ T cells into rats immediately following MI significantly reduced the infarct size, compared with rats that had received CD8+AT2R- T cells. As CD8+AT2R+ T cells were also found in healthy human donors, these results have important implications for AT2R-based clinical treatments of acute MI. The discovery of CD8+AT2R+ T cell allows the researchers at RTC to further define the orchestration of neurohormore and immune cell and to open completely new avenues for future cell therapy in treating patients with inflammatory organ damage including acute heart attack. The article entitled “Identification of Noncytotoxic and IL-10–Producing CD8+AT2R+ T Cell Population in Response to Ischemic Heart Injury” can be found on The Journal of Immunology web site. Curato C, Slavic S, Dong J, Skorska A, Altarche-Xifró W, Miteva K, Kaschina E, Thiel A, Imboden H, Wang J, Steckelings U, Steinhoff G, Unger T, Li J. Identification of non-cytotoxic and IL-10-producing CD8+AT2R+ T cell population in response to ischemic heart injury. 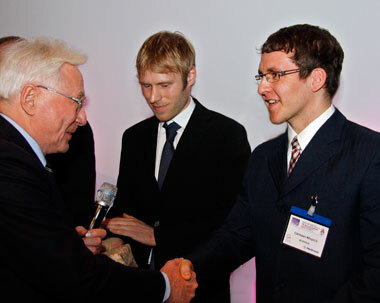 The German Society for Thoracic, Cardiac and Vascular Surgery (DGTHG) honoured two young physicians from Rostock with prizes for their scientific work on stem cell homing: Dr. Christian Klopsch received the Science Award of the Ulrich-Karsten-Foundation for his work in which he examined, whether an injection of Erythropoetin (also known as doping substance EPO) might stimulate bone marrow stem cells to transmigrate into an infarcted heart. Dr. Peter Donndorf got the Young Investigator Award of the DGTHG for his doctoral thesis in which he dealt more basically with the question which enzymes and signal molecules might influence the migration of stem cells to an inflammatory changed tissue. The Science Award of the Ulrich-Karsten-Foundation is award every two years to young scientists who have already presented excellent scientific works in the area of cardiovascular diseases and will put further efforts in this specific field. The DGHTG Young Investigator Award rewards annually experimental and clinically relevant dissertations in the field of thorax, heart and vascular surgery. Both prizes were conferred yesterday during the opening ceremony of the annual conference of the DGHTG in Stuttgart. In fact, autologous stem cells can help in cardiac recovery after myocardial infarction. Present clinical studies on this therapy use autologous stem cells taken from the patient's bone marrow, in most cases from the iliac crest. These stem cells are transplanted to the injured cardiac tissue, either directly by injection or via intravascular catheter technique. It would be more comfortable for the patients, if there was a possibility stimulating the bone marrow stem cells to migrate into the heart, when they are needed for regeneration processes. Dr. Christian Klopsch has shown in rats that after an injection of EPO an increasing number of stem cells can be determined in the infarcted heart. These stem cells might have caused a clear improvement of the heart function, besides the creation of new tissue observed inhere. Long term monitoring as well as analysis of different organs from the animals showed no indication of adverse side effects, e.g. thromboses. Dr. Peter Donndorf observed by intravital microscopy the behaviour of bone marrow stem cells after injection in the vascular system of mice. Under different conditions he focussed on the enzyme eNOS (endothelial nitric oxide synthase). He could show that this enzyme plays a special role in the interaction of stem cells with the cells of the vascular wall. It also has a determining influence on the successful migration of stem cells in inflammatory changed tissue. On Feb 4th, Prof Steinhoff gave a lecture on cardiac stem cell therapy at the international fair BioAsia in Hyderabad (India). Journalists from the daily paper “The Hindu” wanted to know more about the Rostock experience on stem cell therapy: Read the complete interview here (pdf, 260 kb). German heart centers in Rostock, Berlin and Hannover have commenced together with the biotech company Miltenyi-Biotec a randomized, double-blinded multicenter trial on the intramyocardial transplantation of CD133 purified autologous bone-marrow stem cells. The first patient has been treated successfully in Rostock and discharged from the hospital today was reported by Prof. Steinhoff, principal investigator of the clinical study. The study aiming at european medicinal product authorization will last two years and include 142 patients undergoing bypass surgery because of heart failure. The European Association for Cardio-Thoracic Surgery (EACTS) awarded the heart surgeon Dr. Can Yerebakan the distinction for developing an animal model for researching new regenerative stem cell therapies with the goal of curing congenital diseases of the right heart ventricle. The EACTS is the largest association of cardiac and thoracic surgeons in Europe. The „young investigator's award“ for cardiac surgery is a prize for the best research project by a junior scientist and was awarded last week at the EACTS annual meeting in Vienna (Austria). Dr. Yerebakan (32) is resident in the Department of Cardiac Surgery at the University of Rostock in Rostock (Germany). Within the realm of his post-doctorate studies he works on improving therapies for the future treatment of congenital cardiac pathologies. An important step towards new therapies are animal experiments with specific animal models that mimic cardiac diseases. Dr. Yerebakan has developed a novel sheep model in order to study the short- and long-term transformation of activity in the right ventricle. He investigates different therapeutical approaches for widespread congenital heart defects including treatment with stem cells extracted from the umbilical cord.